TUALATIN — They've excelled at the high school level. On the softball and baseball diamonds, and on the lacrosse field, they've shined for the Timberwolves. Now, four Tualatin High School seniors are getting ready to take the next step — and they made that official last week. 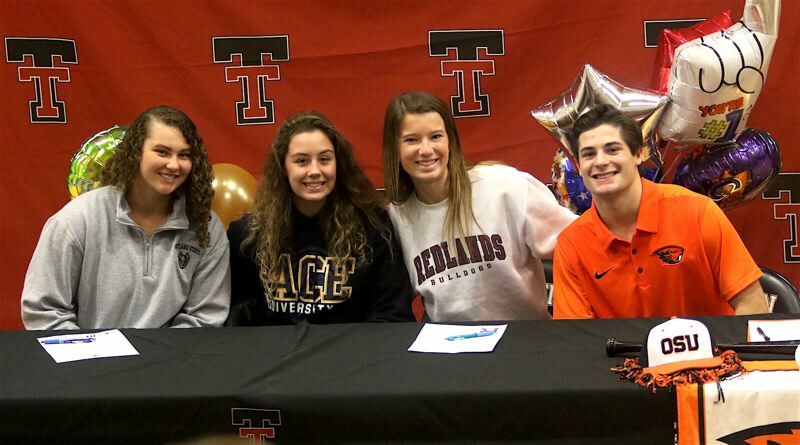 Tualatin seniors Kyle Dernedde, Avery Gales, Emily Johansen and Lauren Magnuson all signed their college national letters of intent in front of a crowd of friends, family, teammates and coaches Nov. 14 during a ceremony at the school. "I've been waiting for this for a long time, and it's finally happening," said Johansen, who signed to play softball at Portland State University. "I've been so excited for this day." "This is extremely special for me," said Dernedde, who signed to play baseball at Oregon State University. "I mean, growing up, watching Oregon State baseball, and watching the program that they've built, wanting to play for them, committing and then signing — it's pretty exciting." Magnuson and Gales, both star attackers for the Tualatin girls lacrosse team, signed their letters of intent, Magnuson with the University of Redlands, located in Redlands, Calif., and Gales with Pace University, located in New York, N.Y.
"That was exciting, signing with Avery," Magnuson said. "She's someone who has always pushed me to get better. The competitive spirit between us is something most people don't get the chance to have." Last spring, Magnuson and Gales helped the Tualatin High School girls lacrosse team win the Northwest Oregon Conference title, at 10-0, while going 11-5 on the season. Magnuson and Gales were both All-NWOC first-team selections. They'll be teammates again for the Wolves in 2019 before heading to opposite sides of the country. "This is a dream come true, honestly," Magnuson said. "Just being there (at Redlands), seeing the campus and meeting the team — I knew it was the right place for me. It was so welcoming and encouraging." Last spring, Johansen, a power-hitting first baseman, helped the Tualatin softball team go 30-0 on the season, in addition to capturing the Class 6A state title. Johansen had 16 home runs during her junior season, including one in the Wolves' 4-3 title-game win over Clackamas. She'll get to keep hitting long balls close to home, when she plays college softball at Portland State. "I really clicked with the coaches," Johansen said of the Portland State softball program. "They've always been so nice to me. They're just so genuine about everything." It also didn't hurt that Tualatin High School head coach Jenna Wilson went from being a Tualatin first baseman to playing at Portland State. "That helped a little bit," Johansen said. "She always talked about Portland State, and she was always gushing about it." Before heading off to Portland State, Johansen has her senior softball season at Tualatin. "I'm super excited about it," she said. "I think we're going to have a lot of fun this year." Dernedde, who has been a star shortstop at Tualatin High School since he was a freshman, has planned on going to Oregon State University for awhile now, committing to the Beavers following his sophomore season with the Timberwolves. "Once that opportunity presented itself, it was kind of a no-brainer," Dernedde said with a smile. "Corvallis feels like home, and it feels like a program I can fit into. I can work hard and be a Beaver." Oregon State, of course, won the 2018 NCAA national championship, with local players, such as Sherwood High School graduates Adley Rutschman and Zak Taylor playing key roles. "It's an amazing program," Dernedde said. "They have so much character down there. It's good guys, and good baseball players. I can't wait." Dernedde, who has been a first-team All-Three Rivers League pick during each of his three previous high school baseball seasons, is also looking forward to his senior campaign with the Timberwolves. "We lost a lot of guys from last year, but I think we can still compete," he said. "I can't wait."